Ex-Federal Railroad Administration (FRA) Chief Sarah Feinberg was in the job for only weeks in 2015 when a commuter train slammed into an SUV stopped on the tracks just north of New York City. Six people died in the train crash. That Feburary 2015 train crossing accident highlighteed a problem that has been with the railroad industry for more than a century: the danger when railroad tracks and roads meet. Feinberg was a former Obama White House advisor who did not have railroad industry experience, and her appointment got plenty of criticism. She sought a new way of thinking regarding keeping the country’s 240,000 railroad crossings safe. Signals, signs, lights and bells are useful, but what if better technology could prevent many railroad crossing accidents? Fenberg, who left the job as FRA commissioner with Donald Trump was inaugurated as president, truly tried to embrace her outsider status in the railroad industry. In a recent interview, she said that she tried to hold railroads accountable when they did wrong. She also said that she had the FRA aggressively policy safety violations; the agency was able to close cases at a higher rate and collect more fine money each year than previous commissioners. After the New York City commuter train tragedy, another train derailed near Philidelphia, killing eight. Feinberg pushed railroads to install positive train control (PTC) technology that would use GPS navigation systems to automatically slow trains if one was getting into a dangerous situation. The technology had long been avaialble, but railroads had slow walked adopting it due to the cost. The industry convinced Congress to delay PTC implementation until 2018, but Feinberg fought back and would not accept any more delays. PTC will begin to be installed in 2018. Feinberg hopes that the next FRA commissioner will continue to push for new technologies to reduce the number of train crashes and derailments each year. Our train crash personal injury attorneys in Virginia are glad that ex-FRA Commissioner Sarah Feinberg was such a strong advocate for PTC technology. Our attorneys have been advocating for this technology for years. There is no doubt that PTC can reduce the number of deadly train crossing accidents and derailments that happen every year. Our railroad crash attorneys know very well the terrible consequences that can unfold in a train derailment. We worked on a record-setting $60 million verdict in a train derailment case in 2000. It involved a gas station attendent who was severely injured when a Norfolk Southern train derailed and crashed into his station. PTC could prevent those types of tragic railroad accidents, and that is why we so strongly support it. A Long Island Railroad commuter train that crashed in Brooklyn on Jan. 4 was traveling at double the speed limit when it slammed into the train station. More than 100 people were hurt, according to federal investigators. The train was going more than 10 miles per hour when it smashed into the end of the tracks at Atlantic Terminal in Brooklyn. The speed limit there is five miles per hour. The NTSB is continuing to investigate the crash and has not yet determined the final cause. The train smashed into a bumping block during the morning rush hour. The train then hit a room beyond the railroad track and caused two cars to derail. The engineer who was operating the train said that he could not recall the crash. Investigators stated that the engineer was very experienced, having started in 1999 at the railroad. He had started working at midnight and was near the end of his shift. The NTSB noted that positive train control was not in place on the tracks where the crash happened. This is an automatic train safety control system operated by GPS that can slow trains automatically to avoid hazardous situations. PTC could have been installed on these particular tracks but they have not been. Our railroad personal injury attorneys have long said that we want to see commuter rail lines in the US fitted with PTC as soon as possible. However, railroads have lobbied congress to delay implementation of PTC until 2018 at least. We hope that this technology is speeded up and installed on commuter lines and trains immediately. When trains have safety problems and derail, the injuries can be terrible. We once represented a man who suffered massive brain injuries when a train in Hampton, Virginia derailed. It slammed into his gas station. 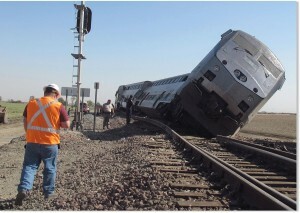 The man’s family chose our firm because of our experience in handling major train derailment accidents. We were glad to have gotten a verdict for the man of $60 million, but we would like to see these railroad derailments never happen again. 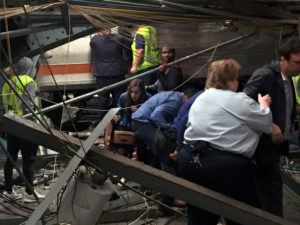 The Amtrak engineer that ran a train off the rails outside Philadelphia in May 2015, which killed eight people, was most likely distracted by several radio dispatches, according to a source close to the federal investigation. The engineer who was running Amtrak 188 informed federal investigators that he hardly could recall the moments before the late night crash. He added that he had a vague, dream like memory of the train going too fast around the curve and he hit the brakes at the train tipped over. Federal investigators found that in the minutes before the deadly crash, there were radio reports that another engineer’s windshield on another train had been hit by something, possibly a bullet. Investigators think that the engineer on Amtrak 188 was distracted by that radio dispatch, as well as a rock that hit his windshield at about the same time. In addition to the eight who died, more than 200 were injured. Dozens of personal injury lawsuits have been filed so far, and Amtrak is not denying liability for the accident. Our Virginia railroad crash attorneys hope that lessons are learned from this tragic train crash in Philadelphia. One of the things that could prevent future incidents is Positive Train Control, which would automatically slow down a speeding train that is entering a curve too fast. Of course, many railroads have opposed federal deadlines mandating the installation of Positive Train Control on all passenger trains. One of our attorneys, Randy Appleton, recently wrote how absurd it is that railroads do not want to spend money on PTC, given the massive liability costs in a major train derailment. Hopefully, all railroads will install PTC in the near future and these types of tragic and fatal train crashes will be a memory. Only a few railroads will come close to meeting a new federal deadline to install new safety technology that may prevent some crashes. Some of those crashes include derailments due to excessive speed, such as the deadly Amtrak wreck in Philadelphia last May. Just three railroads have turned in their safety plans to the federal government. This is necessary before they can place the new technology – positive train control (PTC) – into operation. The railroads are BNSF Railway, Metrolink in Lose Angeles, and Southeastern Pennsylvania Transportation Authority. Amtrak has not yet submitted their plan, but railroad authorities state that they think PTC will be operating in the Northeast Corridor by the end of the year. The PTC being put into place uses GPS, wireless radio and computer technology to monitor the position of trains and will automatically slow or stop trains that may derail because they are going to fast or are about to crash into another train. A rail safety law that was passed seven years ago gave railroads seven years to install PTC. The technology is expensive, and many railroads did not move quickly. However, the May 12 Amtrak crash, which killed eight and injured at least 200, has spurred the federal government to start to push rail companies to get PTC installed as soon as possible. As Virginia railroad accident attorneys, we have seen many train derailments occur due to poor maintenance and lax safety standards on the part of railroad companies. About 40% of train derailments in the US are caused by broken rails and track problems, and many others are caused by excessive speed. A major union, the Brotherhood of Maintenance of Way Employees Division, called this year for rail companies to do more for rail safety and to keep train tracks in proper repair. This is especially important in the case of oil trains; all it takes is one worn out section of track for a major derailment to occur, and this can be a true disaster when dozens of tankers carrying crude oil are involved. Some companies have been fighting the installation of PTC on oil tanker cars, which we find to be truly unfortunate. The installation of PTC can not only reduce the incidence of oil trains derailing: It could prevent most derailments, such as the Amtrak crash that took so many lives. We hope that all railroad companies will get on board and get PTC installed as soon as possible, and generally do more to increase the safety of the US rail system.